Released in May of 2013, this is a DVD copy of the DC Universe animated movie Superman Unbound. In this film, Superman does battle with a new foe known as Brainiac, who is traversing space to collect cities in bottles and then destroy their planets. On Earth Superman, and his teen cousin Supergirl, protect Earth from the coming threat. January 23, 2019 in FILM / RADIO / TELEVISION. This is a copy of Action Comics number 600 published in 1988 by DC Comics when Superman was celebrating his 50th birthday. It contains multiple stories by numerous writers and artists. May 29, 2018 in COMICS / GRAPHIC NOVELS. In honor of the passing of Margot Kidder… Lois Lane. This is a Superman II: The Adventure Continues DC Special Series treasury sized book. The book is filled with behind the scenes stories, interviews with cast and few members, and huge color and black-and-white photos from the production of the movie. The book even includes ads for the Superman telephone, the Atari video game, and the Movieland Wax Museum statue. May 14, 2018 in BOOKS / MAGAZINES. May 14, 2018 in POSTERS. January 12, 2018 in TRADING CARDS. 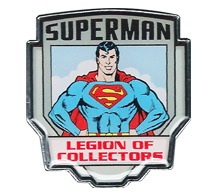 Welcome to the 500th Superman Collectible on this WordPress site! October 30, 2017 in COMICS / GRAPHIC NOVELS. October 4, 2017 in COMICS / GRAPHIC NOVELS.